Those who know me or have read my stuff know that I'm partial to the Curtiss P-40. And P-38s. And Spitfires. That's one of my problems. Seems everybody loves P-51 Mustangs. Well, I like them too. I like too many different airplanes! 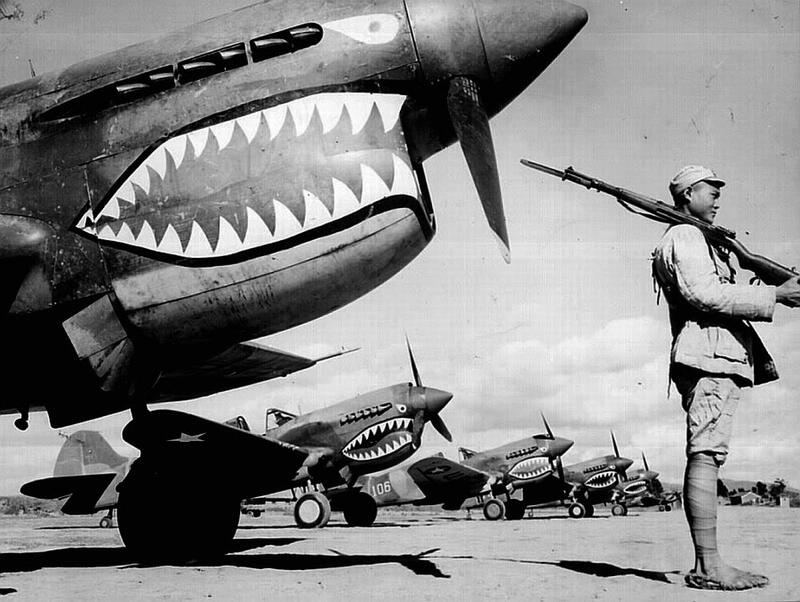 But I especially like the P-40. The P-40 just has the right lines. It looks like a fighter should look. The combination make it look like it wants to eat you up - if you're an enemy pilot. The shark mouth is perfect - absolutely perfect. My friend Chris Prevost from down in Sonoma, California came to visit us for a couple of days a month or two ago. We flew around in my airplane visiting Museum locations. 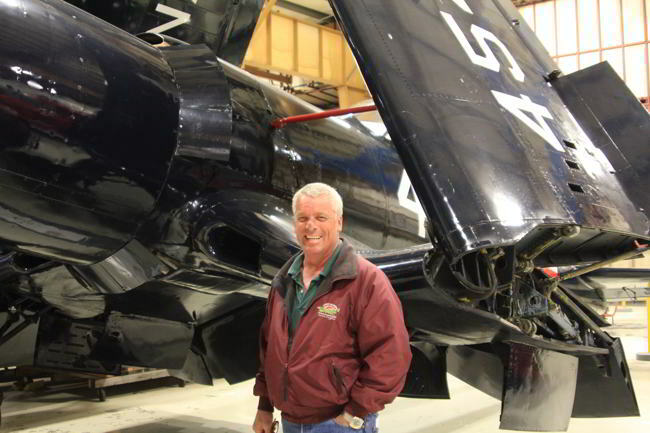 Chris is especially fond of the Museum's Super Corsair. Chris owns an airport in Sonoma and runs a flying business with a bunch of older airplanes, including a Stearman, P-51, Grumman F3F, and..... a P-40. He sells rides in these vintage aircraft. Visit his website here. We got to talking about airplanes (duh! ), and he invited me to come fly his Curtiss P-40. It's an "N" model with two seats and complete dual controls. A chance to fly an extremely rare airplane that is also near the top of your "Love List" doesn't come around everyday. After I finished my airplane's Annual Inspection, I waited for a window when the weather would be suitable for me to fly my airplane down there. Thursday, Aug 4 (2016) looked promising, so we made the arrangements. My RV-12 is not an especially speedy airplane, but it holds its own and - in my opinion - makes a very nice cross-country airplane. Dot decided to come along. We left Port Townsend about 6:40 in the morning and made one fuel stop/lunch stop -- at Hampshire Field - shown here in Grants Pass, Oregon. This airport is named for an Air Corps flyer named John Hampshire, who flew P-40s with the American Volunteer Group (AVG) - better known as the Flying Tigers - with Gen. Claire Chennault in China (see above) even before Pearl Harbor. 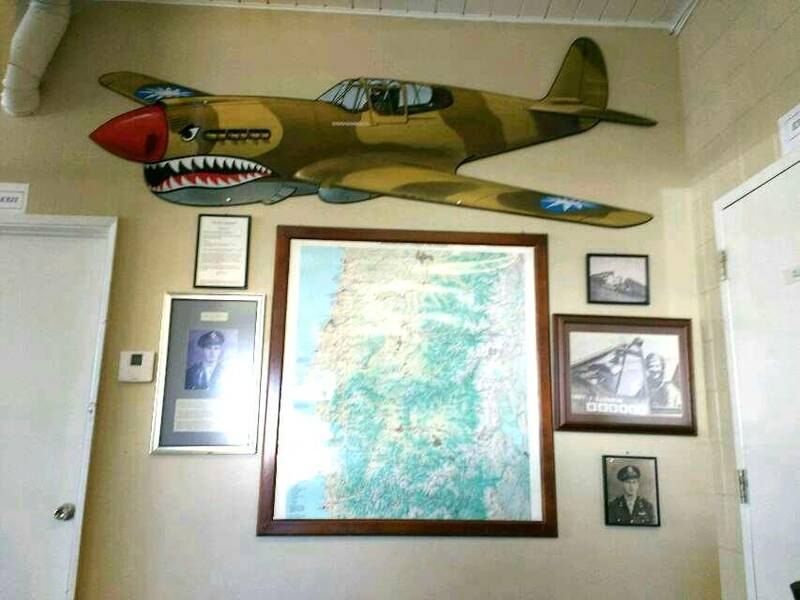 He was shot down after achieving 17 victories over Japanese airplanes, and there was a large Flying Tiger P-40 picture and memorial on the wall in the small terminal. A good omen, and Thank You John Hampshire. The grateful Chinese set off over 100,000 firecrackers to honor his loss. About 2 PM, we arrived at Chris's place at Sonoma Valley Airport. After Chris finished flying a few customers in his (famous) Stearman, (appeared in many movies), we went over to pull the Curtiss out of the hangar. There she is - poking her nose out of the hangar. Happy and Eager to go flying. Don't worry, Dot - this will be a milk run without much enemy opposition. We tried for the Golden Gate Bridge, but it was socked in with fog. We tried not to fly too much straight and level. Steep turns were the order of the day. Chris let me do a lot (most?) of the flying. He said it was an easy airplane to fly -- and it was. Actually, it was sensational. Even I could do it! Enough of that tame stuff - now it's time to get serious. Hey - this is a fighter! It's time to swap the blue and the brown. A few rolls proved we were still aviators and made the old girl happy. Back on the ground with a smile as big as a "Van's Grin." Thank you, Chris - for one of my big aviation Milestones. And thank you, Curtiss, for such a fine flying machine. She flies as good as she looks. Hope Dot wasn't too nervous. We only shot down three enemy planes, and not even a scratch! Here's my baby - even got to spend the night inside cuddled with Chris's Grumman F3F. The next morning, we waited on the usual Bay area early low ceilings and fog. Then about 1100, we scooted out under the crud to the east - along the shoreline of San Francisco Bay - up the river - past the mothball fleet - and into the clear near Travis AFB. 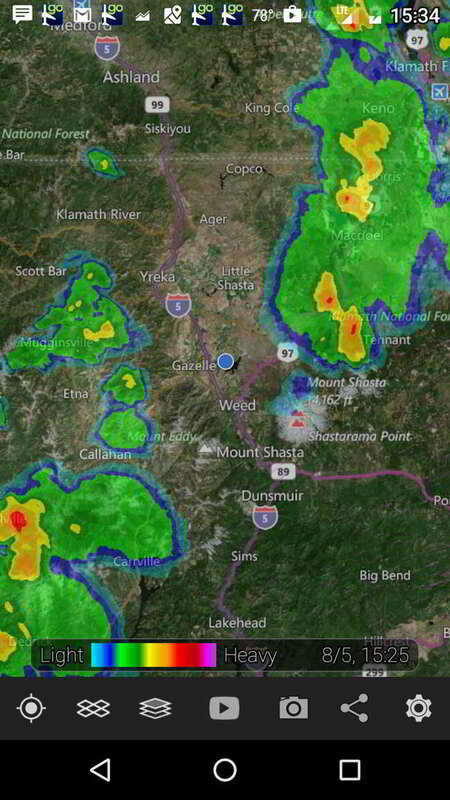 Big CB's (thunderstorms) east and west of Mt. Shasta, but a nice clear corridor between them. My phone app provided excellent radar coverage all the way through the weather. The Blue Circle is our position. Stopped for gas at Cottage Grove, Oregon, where they were having a Boeing Stearman Fly-in. We had a little electrical problem arriving there, but the folks there helped with a speedy repair. Especially Ron England who fabbed this little harness for my voltage regulator in record time! What a guy!!! Finally, arrived back home as the sun was setting. A heck of a trip! A 1700 mile round-trip from Seattle to San Francisco for an afternoon P-40 flying and a great dinner with Chris and Cheryl in Sonoma, and back home with only one night away in a strange bed. Even with this little putt-putt of an airplane. Try doing that with a car on I-5. Or even flying commercial. An amazing Magic Carpet. Isn't flying for six hours boring? Are you kidding me? 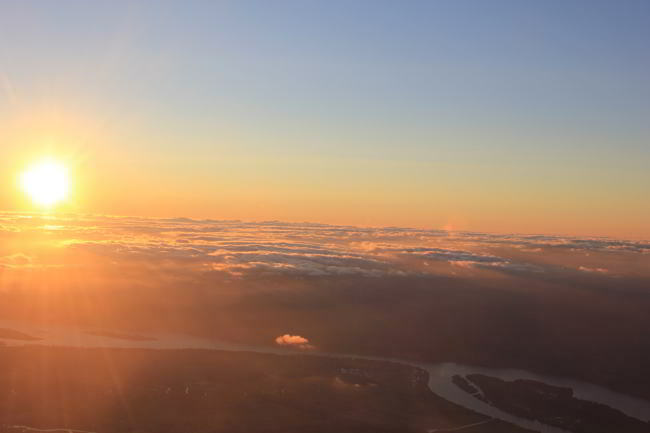 Flying is fantastic and flying in a small plane is a never ending panorama of one great sight after another. Here are just a few I bet you can't see from your car. Baseball - America's sport. Medford, Oregon - 11 baseball diamonds in a cluster. Here are five games in progress at 10 AM on a summer Thursday morning. Waiting for the scrap man.